Ever had too much shortcuts on your desktop? Desktop Organizer is a program that can be used to tidy up your windows desktop while preserving your shortcuts. Just drag or import the shortcuts to Desktop Organizer and from there you can organize them into folders. You can delete the shortcuts on your desktop after that, so that you can use your windows desktop for other purposes or just to enjoy the background image. 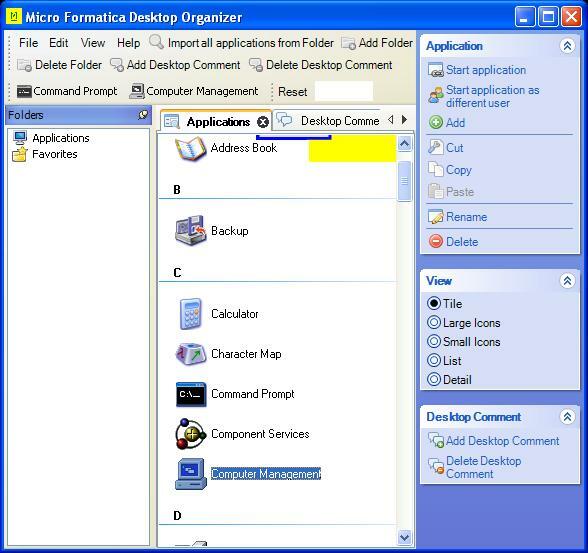 Desktop Organizer is a program that can be used to tidy up your windows desktop. # Fixed: Link would launch "move the file to ..." dialog on Windows Vista Basic, 2003 and XP when application is launched from the main screen. Qweas is providing links to Desktop Organizer 1.8 as a courtesy, and makes no representations regarding Desktop Organizer or any other applications or any information related thereto. Any questions, complaints or claims regarding this application Desktop Organizer 1.8 must be directed to the appropriate software vendor. You may click the publisher link of Desktop Organizer on the top of this page to get more details about the vendor.